A super versatile traditional Greek spanakopita triangles recipe! These little treats are perfect for every time of the day as delicious starter, mid-day snack or light dinner! Greek spinach feta phyllo pie (spanakopita) is commonly prepared in a large pan and then cut into individual portions. This is a variation of the traditional Greek spanakopita recipe, served as individual mini triangles. The itemised portions are far more versatile – the perfect finger food which easy fit in your hand bag or kids lunch box! 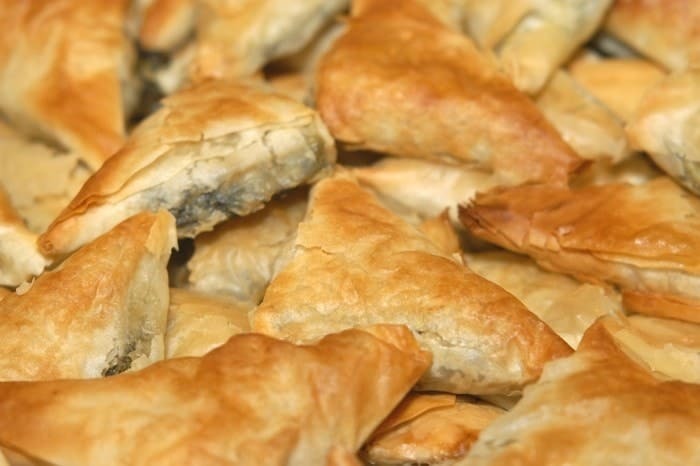 If you haven’t tried Greek spanakopita triangles before, then you are certainly missing out! Why? Because they are crispy, juicy and stuffed with a herby, tangy spinach-feta mixture! These mini spanakopita triangles are like no other vegetarian pie you’ve ever tried before! The main ingredient you’ll need to make this spanakopita triangles recipe is -what else- spinach. To prepare the spanakopita triangles crumble the feta cheese and mix it with some lightly boiled spinach and then wrap them with some phyllo pastry forming a triangle. The finishing touches are nothing else than a light brush with melted butter or olive oil (to keep it healthy) and finally bake them until golden brown and crispy. Simply delicious! Greek Spanakopita triangles recipe – Make your own Homemade phyllo! To prepare this spanakopita triangles recipe you could use either commercial phyllo dough or, if you are feeling adventurous enough, give a more rustic touch with your own homemade phyllo dough with this easy recipe for homemade phyllo for beginners. Whichever you end up using, there is one thing for sure! That they will reward you with a crispy, flaky and simply delicious crust on your traditional Greek spanakopita triangles! So go ahead, prepare these mini spanakopita triangles and you will surely agree that there is nothing better than the smell of a freshly baked, hot from the oven, homemade pie! If you’re a beginner with phyllo, check out some helpful handling tips before start preparing this spanakopita triangles recipe. To prepare this spanakopita triangles recipe start by making the filling first. Sauté the onions in a large knob of butter or olive oil until soft and turning golden. Add the garlic and cook for a couple of minutes. Add the spinach in batches and cook until wilted. Let the mixture cool down for a while and then tip into a bowl, leaving behind any excess liquid from the spinach (you don’t want your spanakopita triangles to become mushy). Mix in the feta cheese, eggs, nutmeg, spring onion and season. At this point you can add some chopped fresh herbs if you like; some fresh dill will surely lift the flavour. This will be the filling of the spanakopita triangles. Preheat the oven to 180C and start shaping your spanakopita triangles. Cut the phyllo sheets in 3-4 lanes (depending on if you like the spanakopita triangles to be small or larger). At the end of each lane add one tablespoon of the filling. Fold one corner to form a triangle and continue folding the triangle upon itself, until the entire piece of phyllo is used. Continue with the rest phyllo sheets and filling. Oil the bottom of a large baking tray, place the spanakopita triangles and brush them with some melted butter on top. Bake in preheated oven at 180C for 25-30 minutes, until golden and crispy. Serve these delicious traditional Greek spanakopita triangles as a great starter with a Greek feta salad aside. Enjoy! ridiculous oven temperature 180C Maybe on Mars! hi I have just made some and froze half and cooked half first then froze. How did you find what ever you did. I was told freeze b4 cooking to preserve flavor and just cook once. Seriously delicious! Never cooked these before but the recipe was easy to follow and my results weren’t too bad. May even make my own phyllo next time! Made them and loved them!! !